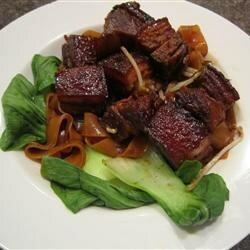 "Named after an ancient Chinese statesman, poet and gourmand of the Song Dynasty, the pork belly is cooked three different ways, rendering the meat succulent, tender and very flavorful. (If you can't find pork belly, ask the butcher; it is what bacon is before it is cured and sliced.)" Slice the pork belly into 2-inch wide strips. Bring a large pot of water to a boil, and stir in the pork slices; reduce heat to a simmer, and cook the meat for 10 minutes. Remove from the water, and blot dry with paper towels. Heat the vegetable oil over medium-high heat in a large wok, and brown the pork strips well on all sides. Pork will splatter - use a splatter shield for this step. While pork is browning, mix together the light soy sauce, dark soy sauce, rice wine, rock sugar, ginger, and spring onions in a large soup pot or stockpot. Bring the mixture to a boil, stirring to dissolve the sugar. Reduce heat to a gentle simmer, and lay the pork strips into the liquid. Cover, and simmer until the meat is very tender, 1 1/2 to 2 hours. Add water as needed to keep the liquid from going completely dry. Chinese rock sugar is available at specialty and Asian grocery stores. If you can't find it, substitute brown sugar. A dash of five-spice powder is delicious, but not traditional. I like to quickly stir-fry some vermicelli with some of the remaining liquid and serve the pork on top. Used Muscato in place of Chinese rice wine. And added a few teaspoons of oyster sauce. Used the water boiled for the meat to replenish the sauce.